It’s an unfortunate fact of life: sometimes we last longer than our teeth. It’s not uncommon to lose teeth to accidents, decay, disease or deterioration. Dentures have historically been the go-to solution, but dentures definitely are not teeth and satisfaction varies. Some people find them awkward or painful, or have trouble chewing. Luckily, dental implants can provide a tremendous improvement. 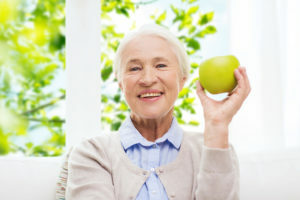 Implant technology is one of the great advances of the last few decades, and enable everyone to have a full set of functional “teeth” well into an advanced old age. If you’re facing missing teeth, why is it important to replace them? While some people might be tempted to soldier on with missing teeth, this means relying on gum surfaces for chewing; restricting the diet to soft foods; or pureeing foods to make them palatable. We do not recommend these solutions–they may ultimately have negative impacts on the health of your mouth and body. When teeth are missing, you have to work harder to chew. Natural teeth have a bite force of 200-250 pounds and dentures have a bite force around 50 pounds. The soft tissue of the gums can’t approach the strength of either. Over time, you’re at risk of suffering irritated, sore, or even infected gums, which will further diminish your chewing ability. TMJ disorders may also result from the loss of teeth. The TMJ is the temporomandibular joint, where your jaw connects to your skull. Disorders of this joint can lead to headaches, tooth grinding, locking of the joint, and pain in the joint. When you are missing teeth, your TMJ has to work extra hard to compensate. The integrity of the bone in the jaw depends on the resistance it experiences during the act of chewing to maintain its strength. When the act of chewing doesn’t place pressure on the jaw, the bone of the jaw weakens over time, becoming prone to fractures and potentially jeopardizing neighboring teeth. Digestion is a complex process depending on multiple organs. Each organ must do its part for successful digestion. The role of chewing is more than simply mechanical and with missing teeth, things get complicated. Long story short, on a purely mechanical level, digestion depends on small food fragments. Large fragments cannot be properly broken down, resulting in incomplete digestion. This means nutrients are not fully extracted. Undigested food can lead to indigestion, discomfort, irregularity and excess gas. Chewing is essential for good nutrient absorption and a healthy, responsive digestive system. If teeth problems are interfering with your ability to chew, talk to us about your options. We’ll be happy to discuss a treatment plan, and explore the pros and cons of dental implants or dentures to resolve your issues and ensure your oral and digestive health.